I’d already run 5.8 miles in the morning with a build up run so I decided that I would take this one steady and just enjoy the running. But ... I still wanted it to be an interesting run! I decided on Ham Hill which is an old quarry, now greenly grassed and populated by a multitude of rabbits and host to a decent pub. It also boasted amazing views as it was just so damn hilly. It was a beautiful evening, the sky was still as blue as forget-me-nots and the air was still and warm. I decided to use a pub as an incentive to lure my parents along. The promise of Somerset cider and a warm evening to sit outside the pub and enjoy it while not having to run appealed to them. We parked outside the Prince of Wales pub at Ham Hill, near Montacute and I left the parents enjoying a pint of Thatchers apiece. I also understood there was to be ice cream later if I didn’t get back from the run too late. Incentives all round. I took the excuse of having relieved my daughterly duties to dash off down some interesting looking trails displaying a multitude of different signs showing the ways to various monuments, villages and trails. Down the wooden steps into the wood. Got to the first crossroads and all signs had disappeared. Never mind. Which way looks the most interesting? Look right and the choice was a wide rutted dirt track, straight ahead; a small footpath down to a stile and a field or left and a winding track leading up into the trees. A quick run in a circle (yes really – like an overexcited labrador let off the lead looking for a widdle) as I decided which looked the most interesting. Up the hill! Bark! The path grew wider and opened out onto a wide flat grassy green with a standing stone and a wooden signpost, arms pointing directions to villages. 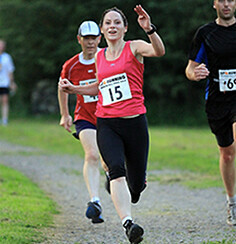 I didn’t want to run to a village – there were steep hills all around – much more fun! I had a look over the gate but all that was there was a field. A very standard field. I didn’t want a field. I wanted hills and interesting paths and new trails. This wasn’t MY way. I dashed back down the path and spotted a hidden footpath on the right. I followed the trail under the trees, over roots and through tunnels of leaves, which brushed against my shoulders and face as I ran. The path twisted and turned and doubled back on itself as though it was trying to throw me off its back. It was treacherous to run, but great fun. It was how trail running SHOULD be. The path would wind around tree roots and up steep, steep hills. I tried to run them but it was like trying to run up a wall. 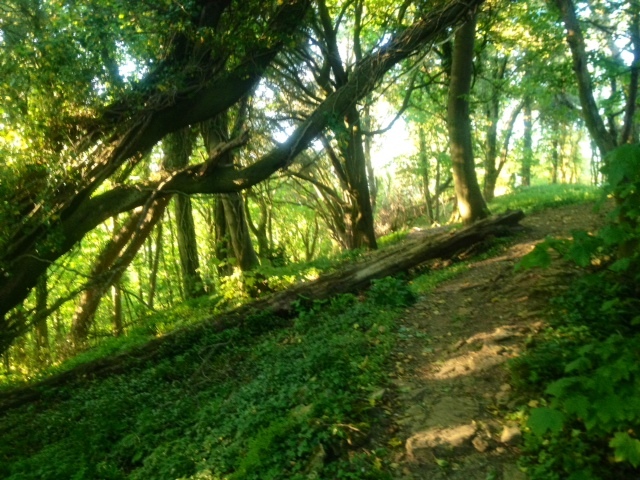 The wood smelled earthy and green and the evening sunlight was slanting in between the branches, making puddles of golden light on the trail. I followed a trail which was part animal track, part imagination and it led down the side of the hill, twisting and turning like a snake and I had its tail. Part running, part falling, I made it to the bottom of the hill breathless and laughing. There at the bottom was a path. 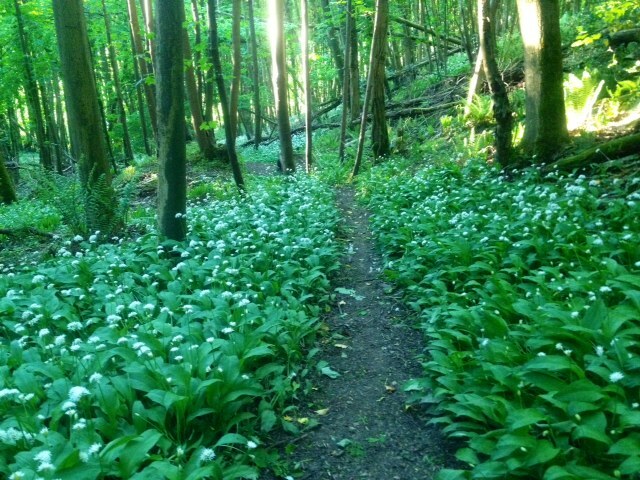 A small, narrow path clearly marked between the high borders of wild garlic, the white spherical flowers like tiny moons perfuming the woods. In the dim light under the trees with the heady smell of the flowers, the wood was dreamlike and felt enchanted. I almost expected hoofbeats and a white stag to leap across in front of me. The path ran next to the ruins of a drystone wall which grew lower and lower until the trail ran along the top of it. I followed the path between the flowers and with my feet on the remains of ancient stones in the gloom of the woods. 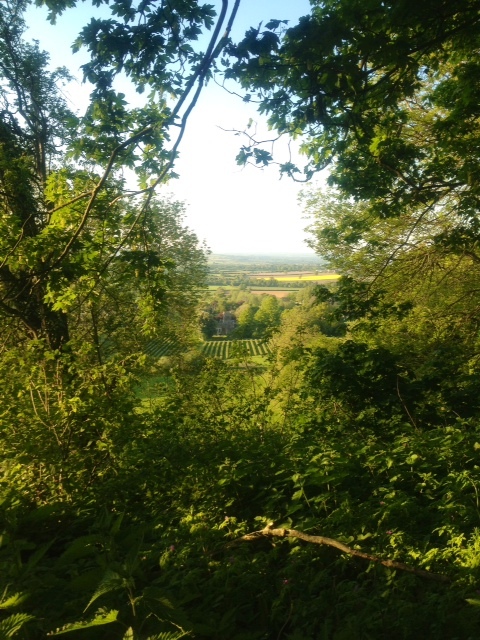 All of a sudden, I came out of the flowers and back onto a lane and into the golden sunshine and dusty hedgerows of an English evening – the enchantment broken. The lane wound downwards between high hedges and banks green and verdant with flowers. I turned a corner following the twist of the track as it turned left and then I stopped. Over the top of a wooden 5-bar gate I spotted a thickly wooded hill crowned by an ancient stone tower... and a track leading up to it. Too much to resist. I climbed over the dusty wooden stile and ran over the field through the long grass to the small gate I could see at the other side. The field was steep and it was hard work running through the grass towards the tower. I could feel my heart beating with the effort. I reached the gate and passed through. Running onwards and upwards, the small path twisted and wound steeply around the tor on which the tower stood. I ran up and on both sides I could see the garlic flowers and the dim violet of bluebells on the steep slopes in between the shady trees. It was beautiful and lonely, but the silence wasn’t peaceful. No one else was there but the feeling was of being watched. The path felt haunted and half-imagined whispers followed me up to the grass on the top of the hill. The faded stone of the tower stretched behind me as I looked out at the view and the patchwork of fields and villages and woods laid out below me like a quilt. It was lovely, but the tower was at my back and I could feel the empty doorway like a hungry mouth behind me. I didn’t want to but as I had climbed the hill, it seemed silly not to climb the steps inside the tower and look at the views from the barred and crumbling windows. 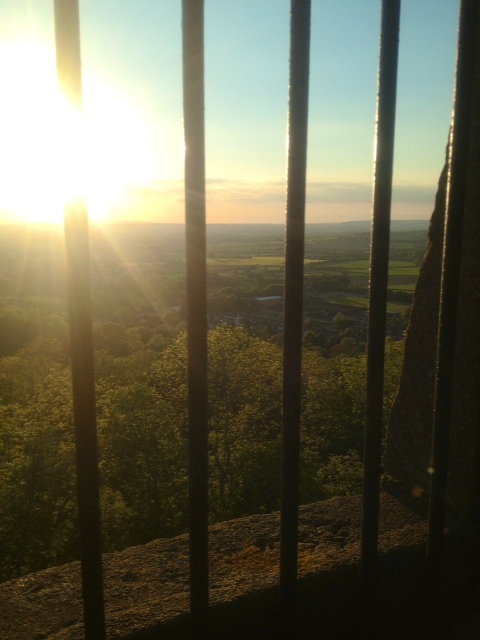 I climbed the stone steps, my hand on the iron rail and my feet making small noises in my running shoes. The stairway was alternately light and dark as the windows lit the steps and then the light faded as I climbed higher. 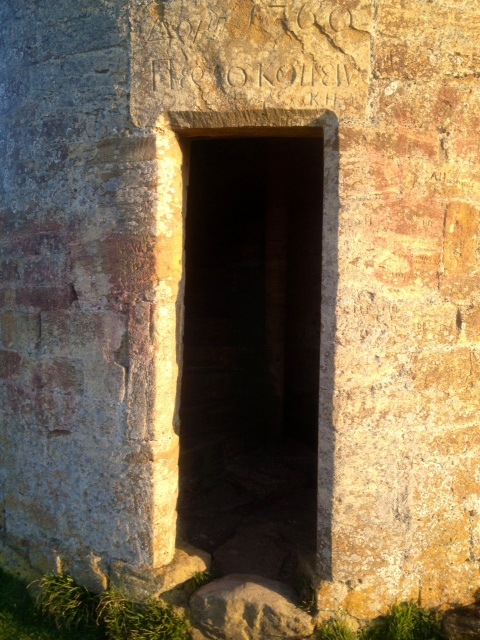 I reached the top which was a circular room with square barred windows. Black graffiti decorated the walls and the crumbling stones were pitted from the weather. The views were amazing but I wanted to get down as soon as I could. The tower had a nasty feel about it, like a smell or a smoke that coiled around the room. I took some photos and fled down the stairs. 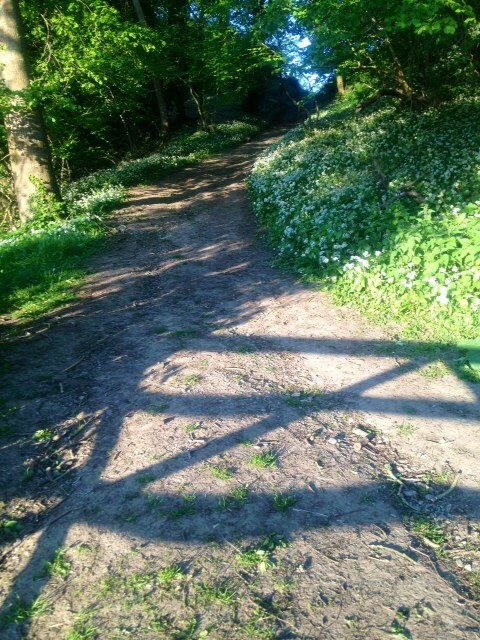 I ran down the path, ignoring the bluebells and flowers, down through the fields and into the lane my feet crunching on the gravel. I followed the lane down, winding past houses tucked away and hedges growing less wild and now trimmed and passing vegetable gardens. And onto the normality of a road with a white stripe down the centre. My feet kept running and followed the pavement past a school and a playground, now quiet on a Sunday evening. Past the church, tower high and glowing golden and a row of yellow hamstone houses. I ran along the pavement, but runs aren’t for pavements and roads. Where were my trails and my hills? I spotted a lane and a restricted byeway sign. I passed some vegetable gardens and the bark of a dog and the lane grew smaller and more dusty as I wound my way up the hill. I followed it upwards and found my way barred by a gate. 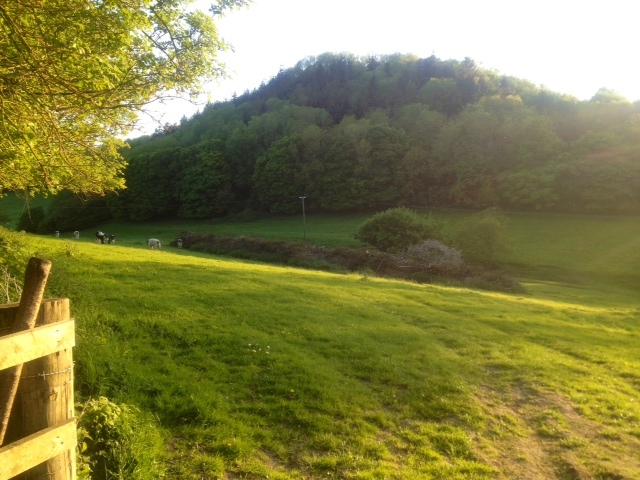 I climbed the gate and found myself in a field of cows peaceful in the evening sunshine. Of the footpath there was no sign so I followed the small line of trees up to the right with a view out across Montacute and spotted a gate. Through the gate and onto a steeply winding dusty path which grew so steep, it turned into stone steps. Up and up and up. 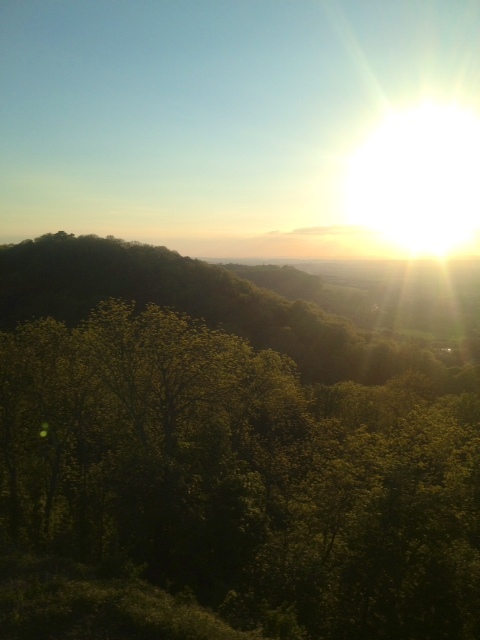 When I turned around to face the view behind me, it was like being at the top of the world. The War Memorial was at my back, a stone finger pointing at the sky. A memory written in stone. We will remember you and we will set a stone here so the children and the children’s children will know of you. Running on and into the quarry, between the humped hills and sheer stone walls, past the circle of standing stones – remember not to pass between them – and onto the gravel path leading back to the pub where a cold cider was waiting for me.